Markem-Imaje introduces its new SmartDate Xtra Ribbon, the most innovative wax/resin Thermal Transfer ribbon dedicated to flexible packaging applications. 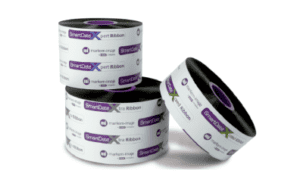 SmartDate Xtra Ribbon sets the new global standard and brings unmatched capabilities to your production line. 25%* more resistant during production. 25%* more resistant during transportation. One ribbon grade will reduce your inventory and logistics costs. High quality coding that will enhance your packaging design. Reduced errors: One ribbon grade for only one setup. 50-83%** added roll length with better printing properties versus market standard ribbons. Conforms to the most stringent health and food regulations. Printheads last longer since the ribbon requires less energy to print. Multipurpose properties make it the right choice for future packaging needs. * Compared to other competitive standard ribbons. ** 1100 m length for X40/X60 coders and 900 m length for the X60-128 coder versus 600 m market standard.